So what's the little guy been up to? He composed the entire music score for the David E. Kelly film (Donnie Darko) film Southend Tales -(that's not the Southend in Essex). 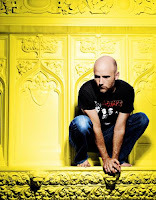 If you're a budding Independent and non-profit filmmaker, film student, or anyone in need of free music for their independent, non-profit film, video, or short you should check out the Moby Gratis section of his Website. You can then listen to the available music and download whatever you want to use in your film or video or short. The music is free as long as it's being used in a non-commercial or non-profit film, video, or short. If you want to use it in a commercial film or short then you can apply for an easy license, with any money that's generated being given to the humane society. But the BIG news, he's got his sixth studio album coming out on March 31st (UK) and April 1st (US) called Last Night. The album was recorded in Moby's home studio in Manhattan NY and features a number of guest vocalists and includes the original 70's mc grandmaster caz one of the writers of rappers delight, sylvia from kudu, the uk's aynzli jones plus Smokey and SO Simple from the nigerian 419 squad. Here's a link to the album sampler "last night" (on arjanwrites.com) which was released on the Moby website for a limited time. I'm enjoying this sample -its got make's-me-want-to-dance-thumping-beats, hip hop-py, old skool vibe with a non mistakable Moby style running throughout, strong female vocals, keyboard tinkling. I think Moby has taken himself on a long journey and is coming back to somewhere near his roots. I guess there's some UK/US culture twisting on it's head back to the 80's and I'm really feeling the New York influence. Even Hot Chip are taking back some of what New Order picked up in New York dance scene in the early 80's and you know what, all I can think of is the TV show, Everybody hates Chris -must be the '80's style clothes that are appearing around London. I always wanted one of those Nike Hi-top jackets but there wasn't really anyway I could get one where I lived, they always cost too much anyway. I guess all the Calvin Harris 80's kids who missed out can get the '80's replay only a little more refined and washed down with a Starbucks on their TiVo. Oh boy, that just went a little stale didn't it, seriously, I love you all. Bring back huge Boom Boxes and the colour burgundy in abundance! Please! Moby will be appearing on the UK's BBC2 ’never mind the buzzcocks’ at 9pm on Thursday 7th Feb. You can catch this program after it has been aired here.